Dangos are a nice little treat that is frequently enjoyed by the Japanese people. These small dumplings are made of rice flour, covered in a sweet sauce, and skewered on small bamboo sticks. Part of the mochiko family of snacks, the dango is well known throughout the nation as a treat for good fortune and offerings to the gods. The sweet and salty treat that we know today is said to have originally come from a small tea store in Kyoto named Kamo Mitarashi, which is found near the Shimogamo Shrine. The name of these dessert balls is said to have originated from the corresponding image between the dumpling and the bubbles that come from the purifying waters, called mitarashi, in the entrance to the shrine. These dumplings were originally made as a small offering to the gods and goddesses found in the shrine. The original Mitarashi dango was originally made in the image of a person. It was skewered in groups of five dumplings. The topmost dumpling would represent the head, the following two would represent the arms, and the remaining two would represent the legs of a person. 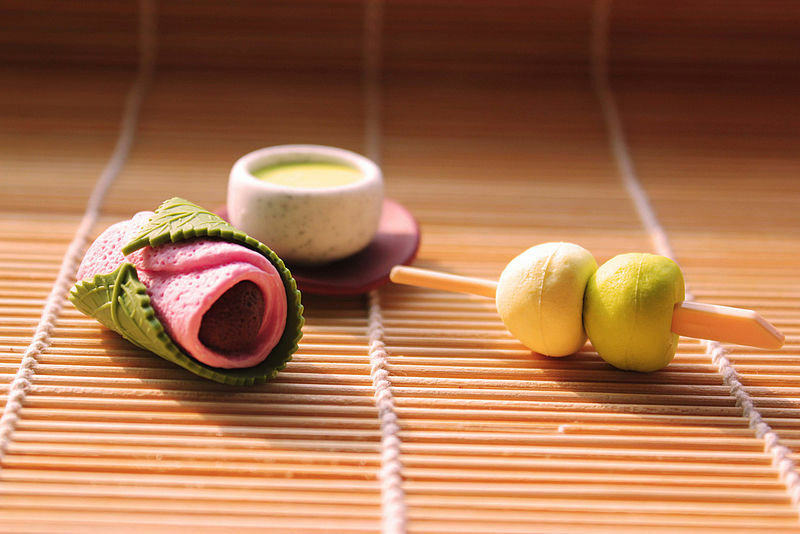 The traditional colors of the Mitarashi dango are red, white, and green. The predecessor the modern day dango has been made by the Japanese since the early Jomon period, which spanned approximately from 1400 to 300 BCE. This version of the dango was made using the nuts foraged from the forests of Japan. These nuts would then be pounded into a fine powder, into a form that is like flour. The powdered nuts would then be mixed in with gruel that was most likely made by boiling rice in water. This was essential to their survival as this meal would last them days during the winter seasons. It was later on that the mixture was incorporated with dumplings. It was during the Muromachi period, which started in the year 1336 and ended in the year 1573, that the trend of having five dumpling skewered on a stick started. The onset of the Edo Period, which started in the year 1603 and ended in the year 1868, had seen a great increase in the partaking of the sweet dumpling snack. In fact, this was a time when the popular saying hana yori dango, which translates to “to enjoy the dumplings more than the cherry blossoms,” had become commonplace. It was only in the middle of the 18th century that four dumplings skewered on a stick had become popular. It is during the Aoi Festival and the Mitarashi Festival, both held at the Shimogamo Shrine, that these dumplings are most popular. Flocks of people come to the shrine during these times to offer the dumplings they brought, whether they bought it from a grocery store or made it themselves, to the deities. The Aoi Festival is said to be one of the biggest and most anticipated annual festivals in the city of Kyoto. This festival is visited by Japanese people from all over the country as it is considered to be the most dignified, formal, and elegant festival in the country. It has been this way since its conception in the eighth century. The festival had gained the present name of Aoi, which means hollyhock, during the Edo period as the festival goers would parade around the area with hollyhock leaves. The popularity of this festival is evident in the number of people who parade in it. A procession of 500 people, dressed in beautiful and ornate traditional clothes that resemble those of the imperial court, parade around carriages pulled by oxen. 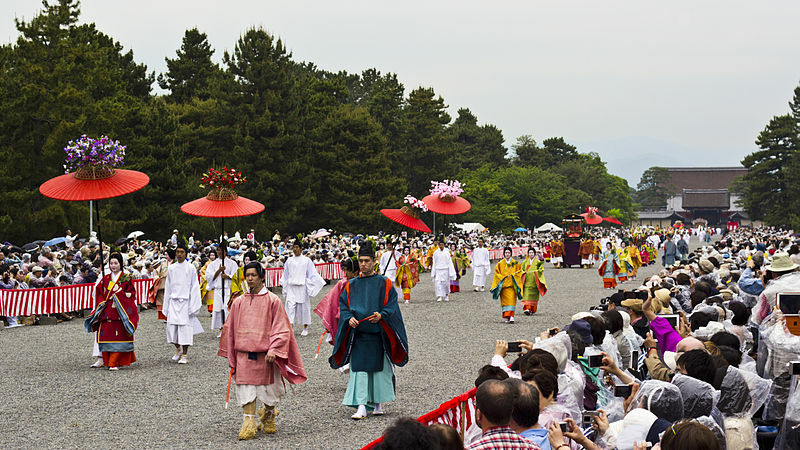 The festival starts with a private service for the imperial family, followed by a Shinto ritual, and ends with a procession that starts from the Kyoto Imperial Palace and ends in the Kamigamo Shrine. The Aoi Festival is often described by many Japanese people through the parade, the traditional imperial music, the ancient and graceful dances, and the dango that people consume by tradition. The Aoi Festival started during the Heian period, which started in the year 794 and ended in the year 1185. The court officials of the time had made a journey to offer their prayers at the Kamigamo Shrine and the Shimogamo Shrine. This parade had drawn the interest of many passersby and this event has since been a sight to behold. This festival is so popular that it has been referenced in many traditional pieces of art and literature numerous times. It is said that these court officials had also offered dango to the deities. One can partake of the festivities every 15th of May. The Mitarashi Festival is held every July. This is a very popular summer festival. This season in Kyoto is often described as hot and humid and the Mitarashi Festival allows people to enjoy the festivities while keeping cool. The aim of this festival is to purify the people of Japan. It is its sole purpose if you will. By removing the impurities in one’s body, the people believe that they are restored to a healthy and lively state. The Shinto belief is that the waters will cleanse your soul and will, in turn, allow you to shine brighter both physically and spiritually. This festival is very popular as it is done in order to promise an illness-free year, specifically in the lower region of the body. The purifying waters that are used in the festival originated from an underground stream. This underground water is extremely cold and is full of minerals. Those who participate in the rituals of this festival pay around two hundred yen to buy a candle and wade upstream. Then, they push through the icy cold water in order to set a candle before the Inoue Shrine, which houses the deity of purification. This purification ritual lasts four days from which thousands of festival goers wade through the knee-high and extremely cold waters in kimonos, or in some cases folded up pants. Those who go through the purifying waters get to drink a cup of the cleansing water at the end. People may also find black stones at the end of the stream which has special spiritual properties that provide protection from ominous and demonic forces. These stones are believed to relieve temper tantrums in children as it drives the negative energies away from them. To obtain these stones, a donation of equivalent value must be made to the shrine. It is part of the festival experience for those who did the purification ritual to buy mitarashi dangos at the stalls located by the shrine as the dangos are made to resemble the bubbles that float out of the water. The legend behind the creation of this Japanese food revolves around the Japanese Emperor of the late 13th century to the mid 14th century, named Emperor Godaigo. The Emperor came to the shrine to worship the Gods, purify his spirit, and his body. When he cupped water with his hands, one giant bubble came up and was soon followed by four smaller ones. He then visualized the big bubble as the head and the four smaller ones as the legs and arms of the human body, called the go tai. From this image, the dumpling were made with four equal sized balls and one smaller one on top. These dumplings became a special offering that people would give when visiting the shrine. After the act of offering the dango to the Shinto deities, the Japanese people would bring home the dango. 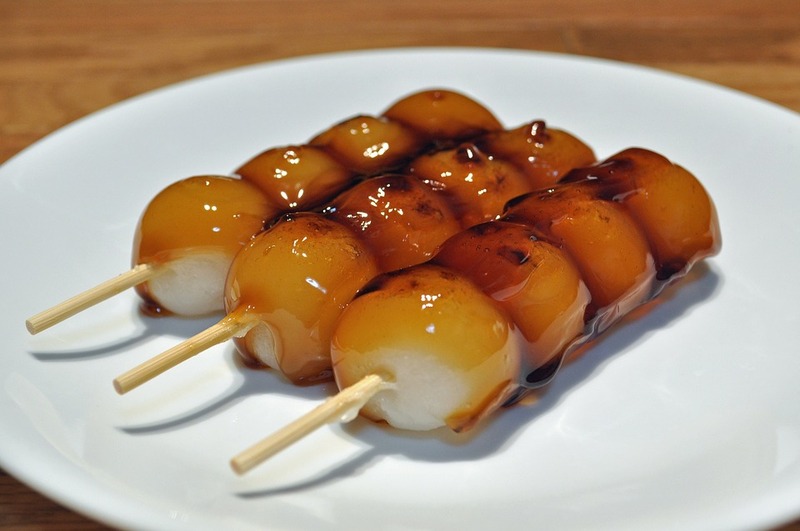 They would then lightly grill the dango over an open flame, generously slather the signature sweet and salty sauce, and eat the dango in hopes of good fortune for the coming days. With the rising trend of being very health conscious and mindful of what one introduces to their body, it might cause some concern for visitors of Japan who are interested in tasting the famous dango. Do not fret as a single serving of Japanese Mitarashi Dango, which contains five (5) dumplings lathered in sauce, only contains 160 calories. This is not too much for a dish that is meant as a snack or dessert. Those looking at their cholesterol and other health factors should also not worry as a single serving of Japanese dango contains 0 grams of fat! That's all kinds of saturated fat to trans fat. This dish also contains 115 milligrams of sodium or salt, 36 g of carbs, 4 grams of sugars, and 2 grams of protein​. It also has 2% of your daily iron needs. The Mitarashi Dango is the most popular type dango with a very sweet taste. Originally coming from the Kamo Matarashi tea house of Tokyo, this dish is famous for the 4 dumplings skewered through a bamboo stick and covered with a sweet soy sauce. It isn’t all that difficult to make your own dango for personal consumption. Just follow the simple steps of the recipe. The first thing that you have to prepare would be the rice. There are two rice flours that are used to create the dumpling, Joshinko, and Shiratamako. Shiratamako is Japanese rice flour made from sweet and glutinous Japanese short grain rice, while on the other hand, Joshinko is Japanese rice flour made from regular short grain rice. When using only Shiratamako to make the Japanese sweet dumpling, it tends to come out as soft and malleable. The Joshinko is added into the mixture in order to give the dango a springier and firmer feel. Some prefer to use only Shiratamako and honestly this is only about the preferences of who’s making it. The first step would be to take around 100 grams of Joshinko, 100 grams of Shiratamako, and two tablespoons of granulated white sugar and mix them in a bowl. Add around 150 milliliters, or three-fourths of a cup, of warm water to the mixer and slowly knead the dough until firm. Keep on kneading the dough until desired texture is achieved. The standard texture for these kinds of mochi would be the same tenderness as an earlobe. You then divide the dough into two equal portions by cutting through the middle. Repeat this until 8 equal portions are obtained. You then take each of those 8 pieces and cut them into three smaller pieces, producing 24 in total. One by one, you then gently drop the balls into a pot of boiling water. Make sure that the pot is large enough to fit all 24 pieces. You will notice that the balls will sink to the bottom of the pot at first. After a while, they will rise to the surface and after around a minute of cooking, you remove them from the pot. Transfer the cooked dango into an ice bath. Drain the dango and skewer them with the bamboo sticks. Using a medium heat, grill the dango. Ensure that each side is evenly cooked and charred by slowly rotating the dango. Let it cook for around four minutes. One may also opt to place oil on a pan and heat it there. Your work should be through to achieve the perfect dango. The classic sweet and salty sauce that has come to be known as the perfect compliment to the Japanese dango is relatively easy to make. The ingredients that you need to prepare are sugar, soy sauce, mirin, water, and cornstarch. First place around five (5) tablespoons of granulated white sugar, one (1) tablespoon of soy sauce, one(1) tablespoon of mirin, and four (4) tablespoons of water in a saucepan. Mix the ingredients and bring it to a boil. Make sure to occasionally stir the mixture to avoid burning. Once the mixture starts to boil add another tablespoon of water and one (1) tablespoon of corn starch. Mix everything well to ensure that all the ingredients are Incorporated and dissolved well. Mix the sauce until it has a thick and heavy consistency, after which turn off the heat. 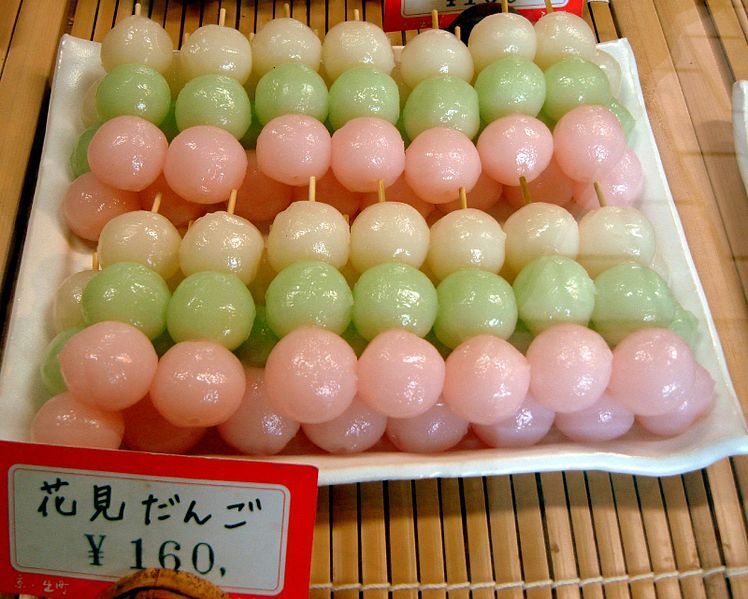 To serve this classic Japanese dessert just skewer 4 dango on a stick and arrange the skewers on a plate as desired. Using a brush, apply a generous amount of the sweet and salty sauce on the dango. This dish is almost always served with green tea. You may try a different dango recipe per month. You may try the Mitarashi Dango in February for Valentine’s Day, Hanami Dango to celebrate the start of Sakura season, Shiratama Dango on June to mark the start of the rainy season, and you can have the Goma Dango as your summer delicacy during the month of August. There is a dango for every occasion!